English, Hindi, Kannada, Tulu and Telugu. Medical Council of India, New Delhi. Member of Indian association of pathologists and microbiologists. Member of Indian Society of Renal and transplantation pathology. Dr. Barkha has obtained her MBBS from Kasturba Medical College, Mangalore in 1997, Diploma in Clinical Pathology from Jawaharlal Nehru medical college, Belgaum in 2000. She completed her DNB training from Apollo Hospital, Jubilee hills, Hyderabad, India and was awarded Diplomate of National Board (Pathology), New Delhi. She joined NMC Royal Women's Hospital in 2014 and since then has been working in other NMC hospitals in Abu Dhabi before joining NMC Royal Woman’s Hospital in 2017. She is a trained Internal auditor for Medical laboratories, ISO 15189:2012 and a trained internal auditor for EHSMS Abu Dhabi. She has completed Laboratory management from Lab management University from American Society of Clinical Pathology and American Pathology Foundation. She has worked as histopathologist at Nowrosjee Maternity hospital and B.J. Wadia Children’s hospital, Parel, Mumbai, a 300 bed teaching hospital and. 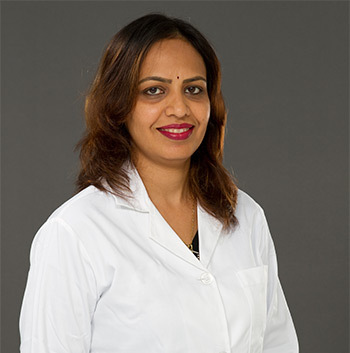 She also has headed the department of Pathology and blood bank in Masina Hospital, Byculla, Mumbai, a 200 bed hospital, specialized in burns and pediatric care and worked as Specialist blood bank in ESI-PGIMSR, Andheri, Mumbai. She has worked as histopathologist in Saboo Siddique general hospital, Mumbai and has worked in other labs in Mumbai before working in NMC Royal Women's Hospital. Dr. Barkha can communicate fluently in English, Hindi, Kannada, Tulu and Telugu.